Something To Be Shy About? What Does Mahatma Gandhi's Message Mean To Me? Many people know that instead of soap, Gandhiji used a stone to scrub himself. Very few people, however, know how precious this stone, given by Miraben, was to Gandhiji. This happened during the Noakhali march, when Gandhiji and others halted at a village called Narayanpur. During the march, the responsibility of looking after this particular stone, along with other things, lay with Manuben. Unfortunately, though, she forgot the stone at the last halting place. "I want you to go back and look for the stone," said Bapu. "Only then will you not forget it the next time." "May I take a volunteer with me?" "Why?" Poor Manu. She did not have the courage to say that the way back lay through forests of coconut and supari, (betel nut) so dense that a stranger might easily lose his way. Moreover, it was the time of riots. How could she go back alone? But go she did, and alone; after all she had committed the error. Leaving Narayanpur at 9:30 in the morning, Manu trudged along the forest path, taking the name of Ram as she went. On reaching the village she went straight to the weaver's house that had been their last halt. An old woman lived there. And she had thrown the stone away. When Manuben found it after a difficult search her joy knew no bounds. Carrying the precious stone, she returned to Narayanpur by late afternoon. Placing it in Bapu's lap she burst into tears. "You have no idea how happy I feel. This stone has been my cherished companion for the past twenty-five years. Whether in prison or in a palace it has been with me. Had it been lost it would have distressed me and Miraben as well. Now, you have seen that every useful thing is worth taking care of, even a stone." 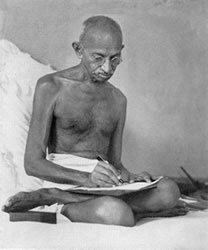 Manuben said, "Bapu, if ever I took Ramanaam with all my heart it was today." Bapu laughed and replied, "Oh yes, one remembers the Lord only when one is in trouble."